When an artist sets paint to canvas, there are brush strokes used for different effects. Sometimes those strokes are subtle, imperceptible; they produce works of art like the Mona Lisa. Other times the very obvious nature of the stroke is the art, as in works by Van Gogh. With some composers of music, the notes on the page are their craft. How those notes translate into an aural experience is what defines some composers as great artists. Brian Ferneyhough has a masterful command of the techniques of putting notes on the page. These techniques are sometimes so subtle, even though written in black and white, they escape detection. Some of what he attempts with his music is just that, to escape detection, to bury the framework, diverting the ear away from the structure, so only the music is heard. The subtlety is so fine it is almost imperceptible. Even though he studied at several institutions, he is considered self-taught, studying scores from Boulez, Stockhausen and Webern. The 'miniaturist' style of Webern is expanded in Sonatas for String Quartet extending the intensity into 20 movements. The other two have their influence felt in his precise technical methods which creates Ferneyhough's complex style. He then employs serialist techniques, or brush strokes, to complete his compositions. Ferneyhough feels there are three types of serialism: generation of material, the sedimentation process and finally channelling materials through a grid. It is the use and non-use of these processes played against each other that creates the extreme tension indicative of his music. By exploring his string quartets, Sonatas for String Quartet, Second String Quartet, Adagissimo and Fourth String Quartet the elements of texture, sound and structure in relation begin to expose some of his compositional approach and the intricate brush strokes he uses. In the Sonatas for String Quartet, the opening bar starts with an example of the minute detail in rhythm which features in all of his works. The piece starts with a pair of semi-quavers played (example 1) as the middle part of two triplet figures (3:2), followed by a demi-semi-quaver as part of a quintuplet. Mathematically the start the third note in the cello is played slightly behind the start of the first two semi-quavers, so the piece begins with an ever so subtle ritardando. The second bar has quavers divided into 3:2, 7:4, 5, 6 for an exact rhythm. 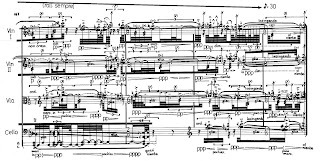 Ferneyhough is as precise with his use of texture by using a mix of harmonics and normal notes in the Cello, non-vibrato quasi sul ponticello sustain in the 2nd Violin and tasto pizzicato glissando in the Viola. It is this demanding exactness to the notation that led to the term "new complexity", a style of music so complex, so precise, extensive information is compressed into the first two bars. To listen to these works requires active concentration. In the forward to Brain Ferneyhough, Collected Writings, Jonathan Harvey describes the performers of these works experience "a new speed of thinking and feeling where hyper-intellectual meets manic raver." Ferneyhough feels it is this intensity of thought that is true beauty. "I find beautiful whatever stimulates, brings forth positive inner turmoil, makes me feel momentarily more intelligent, spiritual, etc., than I otherwise am: transmits a breath of Luft vom anderen Planeten." The Second String Quartet takes the level of precision a step further as he subdivides divisions. In example 2 the third bar has a quaver divided by three with one of the triplets into three again. The bowing is marked and accentuated with dynamic markings of sffz decrescendo to mf in just over half the space of a quaver. The tempo marking is 70 beats per minute, so from very loud to only moderately loud in approximately half a second and then back to sfffz (very, very loud) before that second is over. All of the same textural features in the Sonatas reappear in the Second String Quartet and he adds microtones (pitches a quarter up or down from the designated note) to his inventory of brush strokes. But it isn't just the individual notes or articulations that Ferneyhough uses to generate material. Layered musical concepts are used to create an intricate, precise representation of sound. This technique is seen in the Fourth String Quartet, Section E of the second movement; the voice and strings are giving not only the note durations, but the point of departure at the end of a glissando in bar 1, example 3. In bar 3 the final note of each instrument is so precisely placed, any deviation would create simultaneously sounded notes. But in this instance, they are not simultaneous but instead, become an arpeggio across the ensemble. In solo works, such as Trittico (1989), the same effect is created using multiple staves to deal with complex representation of note events. In the Sonatas the instruments are all playing individual lines. As in example one, the 2nd Violin enters in between a pair of cello notes, the Viola's glissando falls into another cello note and when the 1st Violin enters, it does so alone. The glissando at the end of the 2nd bar with the 1st and 2nd Violins starts together but doesn't culminate together. In the first few pages there are few notes played mono-rhythmically among the four instruments. Yet, there is a melding of the instruments as one leads into another, or accentuates the separation between two notes. There is a unity of purpose. In the Second String Quartet Ferneyhough was looking to extend this unity by creating a "super-instrument". The piece starts with a Violin solo. When the 2nd Violin enters the rhythms are exactly the same. At bar 22 the dynamics begin to vary between the two instruments and eventually, at bar 28 when the Viola enters there are occasional moments where notes not played by all three instruments, but certainly the unison effect is still very evident. It is the breaking down of the unison playing that generates tension. In the Fourth String Quartet there is a shifting between rapid notes and sustained sections. The first bar pf example 3 starts with eleven hemi-demi-semi quavers (in the space of a quaver) followed by a "space" or opening just over a quaver in length where the sustained Cello and Viola ring out. Bar two and into bar there comes another series of repeated notes, followed by a sustained double stop in the 1st Violin half way through bar three and into bar four. This shift between rapid notes and sustains is continued through the first section which ends with a run of notes up to the break - another sustain but one of silence. This example also shows the extensive use of layered rhythmic intervals. The opening bar has eleven hemi-demi-semi-quavers in a 5/16 metre. Bar two for the 1st Violin is divided into 6:5 and then a quaver in 6 again, and then using demi-semi-quavers within that. At the same time the 2nd Violin has the first half of the bar (dotted quaver) give a ration of 5:3 with the second half divided into nine demi-semi quavers. Precise rhythmic movement opposite sustained tones presents sound with a multi-textural experience. Add silence as a technique of sound and we see what the Second String Quartet is about. Silence, however, is not always the absence of sound. There are sections in the Second String Quartet where the rhythmic movement of the piece ends and a shift via a glissando or crescendo occupying the space does not provide any harmonic or relevance as we see in bar 40 (example 5). "The Second Quartet is a quartet on silence: not only the gaps that break up events and processes in the early part of the single movement, but perhaps also the silencing of differentiation that takes over as whistling high glissandos - magical sounds that had appeared in the Sonatas - come to dominate." Silence also plays a large role in both the Sonatas for String Quartet and the Fourth String Quartet, particularly its second movement. In the Sonatas, the numerous movements are broken up by extended pauses yet the piece is to be considered one long movement. The Fourth String Quartet's second movement similarly is a collection of nine elements of the piece broken into smaller segments. It is interesting in the second movement there are only eight named segments (A-H) thus giving the impression the silence between the movements is the ninth and final element. Ferneyhough says, "I then cut the matrix into its nine constituent tempo areas and separated them with general pauses, rather like individual moments musicaux: they represent tiny kaleidoscopic alternative ways of realizing the nine processually distinct subsections of the original continuum." As much as the Second String Quartet is about silence, it is also about the destruction of it. The piece "
disintegrate(s) in a profusion of tremolos, artificial harmonics, glissandos and noise effects-subtly articulated." The subtle shifts from quiet to extremely quiet are augmented by the notes he provides for the end of the piece, "From bar 156 onward begin all lower-string, double-stop glissandi 'sul tasto'; thereafter make a continuous transition to 'col leg. tratt' whilst remaining 'sul tasto' so that the "pure" wood (no hairs!) is reached at the moment this type of material ceases." Example 6 shows there are no unison movement, glissandi or attack. Silence is broken in every direction, but so very, very quietly. It is as if the exploration of sound, or sound verses silence is the way Ferneyhough allows the music to settle into existence. 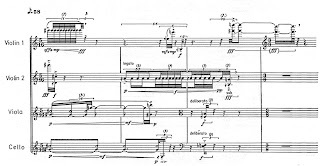 Sometimes there is so much information contained within a bar or a piece, Ferneyhough needs to take a step back and re-examine the intensity expressed in Webern's music. Previously it was mentioned the effect Webern had on the writing of Sonata for String Quartet. But in 1983 Ferneyhough returned to write another "miniature" piece with Adagissimo to explore moment by moment invention. Adagissimo was written three years after the Second String Quartet which is in many aspects the opposite of a miniature examination. In writing the Second String Quartet Ferneyhough used a predetermined numerical scheme which he presents over the first fifty bars, an expanded examination of a single idea. The elements of the idea were then to be separated by silent segments, which were later occasionally replaced with "sonic activity" such as glissandi or tremolo. Even though the Second String Quartet is considerably longer than Adagissimo, the elements function very much the same, small ideas presented in compact form. By using a grid like process he was able to create the over all structure of the piece and bind it together. With the Fourth String Quartet the last movement composed was the Second, which was initially based on a 13-layer rhythmic matrix based on the overall structure of the piece. He also pre-organized the integration of the voice with the instruments so the voice is always derived from aspect of the instruments, highlighting certain pulses or re-presenting them. The final movement was composed with register, density of events, dynamic all processed linearly. His music is complete, from texture to sound to structure. noise effects" allows the music to move and still be heard, to be intense but not overwhelming. The structure that binds it all together becomes invisible, inaudible and imperceptible. 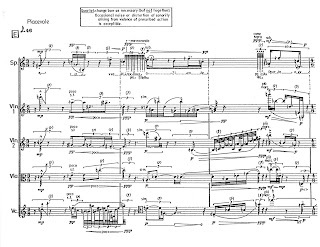 By generating a variety of musical textures using extreme articulation and exacting rhythmic placement, then letting the sound of these textures together and in absence settle in with the listener and building a structure that allows them to move through space Ferneyhough paints with music pieces that are truly works of art.